Queen Elspeth: Mirror, mirror, on the wall, who is the fairest one of all? Mirror: You are. You are. You are the fairest one of all. Queen Elspeth: Oh, you're just saying that. For the better part of the last decade, Hallmark has been producing elaborate made-for-TV movies that reinterpret popular stories or fairytales. Recent examples include Jack and the Beanstalk: The Real Story and The 10th Kingdom. The latest is Snow White: The Fairest of Them All and it easily ranks as the oddest interpretation of the Brothers Grimm story I've seen. The plot is the same, at least in broad strokes. 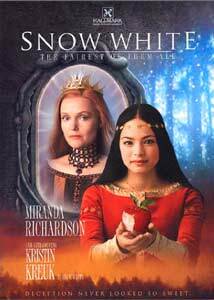 The wicked queen (beautifully played by a charismatic Miranda Richardson) is obsessed with being the most beautiful in the land, and she'll do anything to rid herself of her only rival, the youthful Snow White (Kristin Kreuk). Screenwriters Caroline Thompson and Julie Hickson aren't content to stick to the most established versions, however. Departing from both the original tale and the popular Disney version, The Fairest of Them All introduces a number of new story elements that, at least, keep things interesting. The seven dwarfs of the Disney film are now named after the seven days of the week, and together they control the weather and can teleport from place to place by creating a rainbow. The wicked queen's motive is revealed as well. She was a horrific peasant hag until her brother, the Green Eyed Monster, having been freed from an icy prison by Snow White's father, granted her beauty and her place as his queen. Queen Elspeth becomes the most interesting character in the story, throwing about her enchanted magic mirror and sulking over Snow White's beauty, thanks in no small part to a wonderfully outlandish performance from Richardson. As usual, I'd rather have seen the wicked stepmother come out on top. Of course, it's difficult to root for a character as bland as Snow White, who does nothing but putter around sweetly, and it becomes doubly hard when the actress portraying her (Kristin Kreuk, from Smallville) has so little screen presence. More enjoyable than Snow White's plight are the antics of the dwarfs, portrayed by such noted character actors as Warwick Davis and Vincent Schiavelli. There is quite a bit of amusing banter betwixt the "days of the week" (I particularly enjoyed Thursday, who, as you'll remember from the poem, "has a way to go"). The production is pretty elaborate for television, but the special effects have the same cartoon obviousness as the other Hallmark series and specials. The production and costume designs keep things visually interesting, though, with the Queen's circular room of mirrors and her many elaborate gowns. Though there are too many moments that don't work (including a convoluted and confusing subplot about a glass shard that, when caught in a man's eye, will force him to fall in love with the queen), and several that feel totally superfluous (Snow White's love interest, who is really only here to get turned into a bear and then wake her up at the end), this version of Snow White is, while not the fairest of them all, at least fairly entertaining. Image Transfer Review: Presented in its original 1.33:1 television aspect ratio, the transfer here is generally pleasing but flawed. While colors are bright, they often appear oversaturated, to the point where fleshtones take on an orange tint. There also seems to be a bit of bleeding in bright blues and reds. Blacks are strong, shadow detail is lacking, especially in many of the darker scenes. Otherwise, I noticed no artifacting or aliasing and no edge enhancement. Audio Transfer Review: Audio is presented in largely indistinguishable 2.0 and 5.0 mixes. Both feature a strong front soundstage, with very little support from the surrounds. The 5.0 mix is preferable as it anchors the dialogue in the center channel, where is always sounds clear and natural. The front mains expand a bit with the score and minimal directional effects, but for the most part, this production's TV roots are quite evident. Extras Review: The extras here fall strictly into the promotional camp. A Look Behind the Scenes runs 10 minutes and is full of the typical laudatory statements about how wonderful everyone is in the film, etcetera, etcetera. Kristin Kreuk lets us know that the first time she read the script, she was so enchanted she, "read it all the way through." Time is spent also on the special effects, with frequent comments from the effects crew. Trailers are included for two other Hallmark productions, including Jack and the Beanstalk: The Real Story and Stranded, and a clip promoting the Hallmark Channel. Finally, in addition to some fairly lengthy cast and crew biographies, there's Kristin Kreuk's Neutrogena commercial, because... because... um. Anyway, Kristin, who looks like she has never had a facial blemish in her life, lets the less fortunate of us know that Oil Free Acne Wash Cleansing Cloths can save our pitiful little lives. An interesting, if cartoonish, reinterpretation of the classic fairytale, Snow White: The Fairest of Them All may nevertheless stray too far from its roots to please fans of more traditional tellings. Give it a try, though, if you've enjoyed previous Hallmark miniseries.